America’s most recent election is best recollected in “final straw” moments. Whether Donald Trump was scorning the Muslim parents of a slain soldier, accusing a female anchor of menstrual bias, or goading fans to beat up protesters, his obituary was written weekly. The same applies to his presidency. Last week, Mr Trump supposedly plumbed new depths by describing Haiti and Africa as “shitholes”. We forget that he launched the campaign by branding Mexicans as rapists. Now, we are told, he has really gone and done it. Except that he has done it so many times before. We are blinded by our outrage. In reality, Mr Trump’s position has rarely been stronger. Later this month, he marks his first year with his State of the Union address. It will be tempting to see it as another way station on Mr Trump’s road to oblivion. No president has finished his first year with such low approval ratings. Come to think of it, none had such poor numbers after three months, six months, at Thanksgiving and so on. Mr Trump just keeps scraping new lows. In reality, though, his numbers have not moved. Mr Trump lost about 10 points within his first month in office. His ratings have been hovering at between 35 and 40 per cent ever since. Which of these stories tells us more? The historic lows or the fact that Mr Trump has lost little support in the past 11 months? We should pay equal attention to the latter. Philosophers teach us to sift reality from desire — the “is/ought” distinction. The fact that Mr Trump so deserves his comeuppance too often spills into forecasts of his demise. If we switch to the “is” lens for a moment, the picture looks troublingly different. The president now has a near total grip on the Republican party. Both wings — the “moderates”, on one side, and the pyrotechnicists, once led by the outcast Steve Bannon, on the other — have fallen into line. A few weeks ago, disaffected Republicans, such as Bob Corker, the Tennessee senator, were vowing a brave stand against Mr Trump. The White House was “an adult day care centre”, said Mr Corker. Mr Trump could trigger “world war three”. But when it came to a vote on the $1.5tn tax bill last month, ­Republicans such as Mr Corker rallied round. Whatever growth results from the ­corporate tax cut will be Mr Trump’s to brandish. This week, Zogby Analytics gave him a 46 per cent approval rating. In reality, the stimulus will be shortlived, skew to the wealthiest and accelerate the interest rate cycle. But polls measure how people feel now. Last week, Mr Corker travelled with Mr Trump on Air Force One. Suddenly, they were buddies again. The same goes for all but a couple of his peers. If Mr Trump were a marsupial, the Republican party would be in his pouch. We should not expect them to act as a check on his power. People are now looking elsewhere. The latest hopes are projected on to Mitt Romney, the former presidential nominee, who is planning a Senate run. He will speak truth to power, we are told. During the 2016 election Mr Romney called Mr Trump a “fraud” and a “phoney”. Once he has arrived in the Senate, Mr Romney will be the one who stands up and says: “Have you no shame, sir?” Someone has to say it, right? Alas, pretty much everyone has been saying it everyday — but to no effect, since Mr Trump has none. Besides, Mr Romney auditioned unsuccessfully to be Mr Trump’s secretary of state. There is no reason to suppose he will be any less of a weathervane than Mr Corker. What about the Democrats? They have placed their chips on Robert ­Mueller, the special counsel. Mr Trump’s second year is as likely to be as badly disrupted by the Russia investigation as his first. Bigger scalps, including Jared Kushner, his son-in-law, and Donald Trump Jr, are likely. The chances are that Mr Mueller will land a damning report on Capitol Hill at about the time Democrats are likely to regain control of Congress. But there are two wrinkles to the Trump impeachment story. First, Democrats will need a lot of Republicans to co-operate. There is little chance of that. Indeed, Republicans and the Fox News-led “conservative entertainment complex” are doing their best to discredit Mr Mueller. Second, Mr Trump has a knack of inciting liberals to stereotype themselves. The more Democrats invest in the Trump outrage machine, the less they put into a case for governing. Unlike winning campaign themes, which are hard to come by, outrageous Trumpisms grow on trees. America’s president has an unlimited supply of them. He ought not to be president. Yet he is. Will Democrats grasp the difference in year two? Now that the recessions in Argentina and Brazil have ended, the major economies of Latin America are looking forward to sustainable – if modest – growth rates in 2018. Yet significant domestic and international uncertainty clouds the longer-term outlook, according to experts from Wharton and elsewhere. “Domestic demand in the region is recovering gradually….,” notes a recent report by the International Monetary Fund (IMF). And despite the “full-blown economic, humanitarian and political crisis” of Venezuela — where real GDP plummeted about 35% from 2014 through 2017 – the regional economy is expected to have grown by 1.2% in 2017, rising modestly to 1.9% in 2018, notes the IMF’s latest regional outlook. Moreover, inflation in Latin America likely declined to 4.2% in 2017 from its peak of 6.2% in 2015, and is projected to stabilize at about 3.5%. In 2016, both Brazil and Argentina were in recession, and in 2017 Brazil grew by just 1%. But in 2018, Argentina is projected to grow by about 3%, while Brazil will grow 2%-2.5%. In the rest of South America – including Colombia and Chile — expectations are for higher growth than in 2017. “With the exception of Venezuela, which is doing very poorly, the region will be in a better place; it will grow more,” adds Monteiro. In Mexico, the GDP advanced only 1.5% year-on-year in the third quarter of 2017 (according to the latest figures), slowing from the 1.9% rate reported in the previous quarter. According to Trading Economics, this was Mexico’s weakest growth rate since the fourth quarter of 2013, as services and agriculture slowed down while industry shrank. The trend appears to reflect a gradual slowing from the 2.6% GDP rate of 2015 to a projected 1.9% in 2018, notes the IMF. For all that, not a single country in Latin America is really growing at a “robust” rate, notes Wharton management professor Mauro Guillen. Unemployment is very high in countries such as Brazil and Argentina, while inflation is high in Argentine and Venezuela, which has the highest rate in the world. Guillen identifies two broad categories of uncertainty that continue to hamper Latin America’s performance: politics and relationships outside the region, such as with the United States and China. Political instability within the region has been an issue a few years, Guillen says. In 2018, more instability could follow national elections set in Brazil (October), Colombia (March), Mexico (July), as well as in Paraguay and Venezuela. Kemmsies thinks “Brazil is setting itself for a much better future. We knew there was a lot of corruption in Brazil, but what is surprising is that [although] it created a lot of political upheaval, we don’t see the tanks of the military rolling through the streets. Democratic processes are working, and that makes me very hopeful about the economy” – and the prospects for attracting further foreign investment to Brazil. A contrasting scenario would involve less polarization of the Brazilian electorate. Here the situation would resemble that of France during its most recent presidential elections (in 2017), when two extremists — Marine LePen, from the right-wing, and Jean-Luc Melenchon, from the left — were major candidates. Notes Monteiro, “There is the hope that someone in the middle will be able to mobilize all the forces that are not on the extremes” as did Emmanuel Macron in France. Potential candidates for that role include Joao Doria, current mayor of Sao Paulo, and Luciano Hulk, a TV anchor with no political experience. Despite such uncertainties, Monteiro expects Brazil will continue to attract significant foreign investment in 2018, especially in the oil and gas sector. In October, Brazil awarded six of the eight blocks on offer in the auction for the rights to pump oil from Brazil’s highly prized offshore “pre-salt” region, where billions of barrels of oil are trapped below thousands of feet of salt in the country’s Atlantic waters. Royal Dutch Shell won half the blocks, while rival BP took two blocks and Exxon Mobil Corp took one. President Michel Temer announced that development of the blocks would lead to 100 billion reais ($30.2 billion) in investment from the winning companies, and 130 billion reais ($39.3 billion) in royalties and other revenues for the Brazilian government. Mexico’s economic dependence on the United States has helped generate significant economic growth in recent years, but continued uncertainty about the future of the North American Free Trade Agreement (NAFTA) – which plays a key role in that relationship – makes it difficult to predict Mexico’s economic prospects. Despite months of heated negotiations with the United States and Canada, it remains unclear whether NAFTA will survive largely intact, see significant changes or be scrapped entirely by the Trump administration. For several years, Mexico’s government has been attempting to diversify trade from its over-dependence on U.S. markets. Some 80% of Mexico’s exports go to the U.S. and about 47% of Mexico’s imports come from the U.S. Mexico has 11 free trade agreements involving 46 countries and also signed on to the Trans-Pacific Partnership (TPP), a proposed free trade agreement signed by 12 Asia-Pacific countries, in 2016. Last January, the U.S. announced it would not be part of the pact. How much will those pacts help Mexico over the long term? Guillen says it’s is hard for Mexico to diversify its trade away from its dependence on the U.S. for two reasons: First, the mutual border — neighbors tend to trade more with one another. Second, most company decisions over the past 20 years involve value chains dependent on shipping materials and components between the U.S. and Mexico. If it were just a case of shipping final goods to the American consumer, Guillen adds, diversification would be easier. Another key economic driver for the region is the ongoing scale of China’s growth plans, which will impact Latin American commodity export volumes and prices. Despite some mixed signals, China is planning huge investments, most notably its “One Belt, One Road” initiative, a grand scheme for creating a network of roads, ports, railways and other links from East China through Southeast, South and Central Asia all the way to Europe. China expects to lend as much as $8 trillion for infrastructure in 68 countries – which would affect up to 65% of the global population and a third of global GDP, notes a McKinsey report. China’s ambitions could spur quite strong demand for commodities produced in Chile, Peru, Argentina and Brazil, says Guillen. “That would be great because we would be going back to the situation of six or seven years ago – when there was a commodities boom that helped the countries in the region.” Already, China and other major countries in Asia are the biggest trading partners for Peru, Brazil and Argentina. “The relationship between Latin America and Asia will be even more important because the economies of that region are growing even faster – and they will need some commodities from Latin America to produce that growth,” notes Guillen. As for Brazil, Kevin Gallagher, professor of global development policy at Boston University, notes that China’s commercial relationship with South America’s largest economy has taken on a new character. While commodities continue to underpin the region, “the boom is over … but there is now a shift toward infrastructure, banking and some manufacturing.” Over the first four months of 2017, Chinese investors invested $5.7 billion in Brazilian mergers and acquisitions, about 37.5% of total investments in Brazil, according to Dealogic. Economists note that China has been diversifying investments in Latin America away from Venezuela and Ecuador into more financially stable economies such as Brazil. Last year, notes Monteiro, Chinese companies pulled off 17 acquisitions in Brazil, involving electricity companies and those involved in oil, ports and other infrastructure. Chinese investors even invested in 99 Taxi, a Sao Paulo company that competes with Uber. Monteiro predicts that China’s ascension as the major trading partner of Brazil will continue in 2018. While the U.S. is not “pushing against” Brazil, “there is nothing in the agenda” of the Trump administration that is specifically focused on boosting U.S. business with South America and Brazil. Meanwhile, Colombia, Peru and Chile each have bilateral trade agreements with the U.S., which operate on the same or similar principles as those of NAFTA. For those three countries, the Trump administration’s trade policy also represents “potential threats or uncertainties” to Latin America that could become big challenges, notes Guillen. Colombia is something of a poster child representing a country that has manged a fairly spectacular economic turnaround over a number of years. Still, the gains have been uneven with some parts of the country lagging significantly far behind others. For example, even in the southern areas of Bogota, the country’s capital, “the land is being used horribly inefficiently. Eighty percent to 90% of the land is being covered by low-quality, low-rise residential buildings, and there is no space for utilities or schools or roadways.” While some cities are addressing these challenges, “there is no impetus at the highest level [of government] because all of their time and energy is being devoted to the peace process,” which culminated in a controversial 2016 peace agreement with the FARC rebels. For many in northern Colombia, notes Duranton, “the biggest worry is the collapse of Venezuela” – especially in places like Bucaramanga, 200 kilometers from the Venezuelan border. There are already tens of thousands of immigrants from Venezuela in that part of Colombia. “The irony is that historically, Colombia was a poor country and Venezuela was really rich – so there was mass immigration of Colombians looking for work in Venezuela. But then you had a crazy government in Venezuela that started breaking everything, and now it has become a really poor country.” Now, immigration runs in the opposite direction. ZURICH – Respected economists have long pointed out that gross domestic product is an inadequate measure of economic development and social well-being, and thus should not be policymakers’ sole fixation. Yet we have not gotten any closer to finding a feasible alternative to GDP. Another well-known flaw of GDP is that it does not account for value destruction, such as when countries mismanage their human capital by withholding education from certain demographic groups, or by depleting natural resources for immediate economic benefit. All told, GDP tends to measure assets imprecisely, and liabilities not at all. Still, while no international consensus on an alternative to GDP has emerged, there has been encouraging progress toward a more considered way of thinking about economic activity. In 1972, Yale University economists William Nordhaus and James Tobin proposed a new framework, the “measure of economic welfare” (MEW), to account for sundry unpaid activities. And, more recently, China established a “green development” index, which considers economic performance alongside various environmental factors. Moreover, public- and private-sector decision-makers now have far more tools for making sophisticated choices than they did in the past. On the investor side, demand for environmental, social, and governance data is rising steeply. And in the public sector, organizations such as the World Bank have adopted metrics other than GDP to assess quality of life, including life expectancy at birth and access to education. At the same time, the debate around gross national income has been gaining steam. 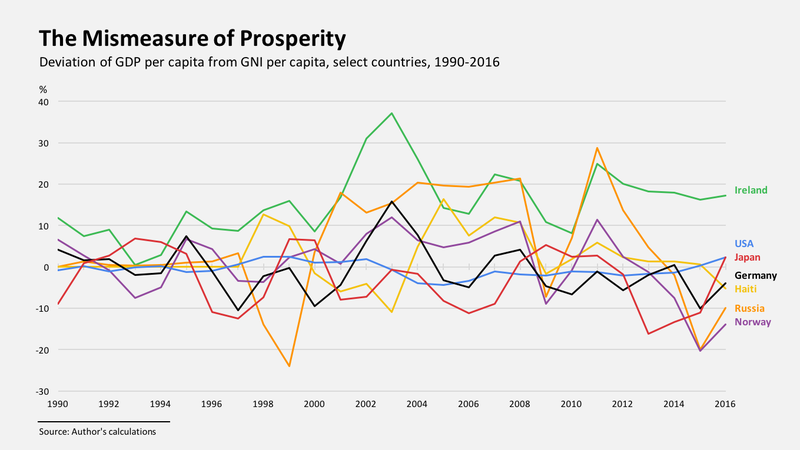 Though it shares fundamental elements with GDP, GNI is more relevant to our globalized age, because it adjusts for income generated by foreign-owned corporations and foreign residents. Accordingly, in a country where foreign corporations own a significant share of manufacturing and other assets, GDP will be inflated, whereas GNI shows only income the country actually retains (see chart). The OECD paper went on to conclude that GDP is not a reliable indicator of a country’s material well-being. In Ireland’s case, its single year of astonishing GDP growth was due to multinational corporations “relocating” certain economic gains – namely, the returns on intellectual property – in their overall accounting. To address the growing disparity between actual economic development and reported GDP, the Irish Central Statistics Office introduced a modified version of GNI known as GNI*) for 2016. The gap between GDP and GNI will likely close soon in other jurisdictions, too. In a recent working paper, Urooj Khan of Columbia Business School, Suresh Nallareddy of Duke University, and Ethan Rouen of Harvard Business School highlight a misalignment in “the growth in corporate profits and the overall US economy” between 1975 and 2013. They find that, during that period, average corporate-profit growth outpaced GDP growth whenever the domestic corporate-income-tax rate exceeded that of other OECD countries. In late December, this disconnect was addressed with the passage of the 2017 Tax Cuts and Jobs Act. By lowering the corporate-tax rate to a globally competitive level and granting better terms for repatriating profits, the tax package is expected to shift corporate earnings back to the United States. As a result, the divergence between GDP and GNI will likely close in both the US and Ireland, where many major US corporations have been holding cash. Looking ahead, I would suggest that policymakers focus on three points. First, as demonstrated above, the relevant stakeholders are already addressing several of the flaws in GDP, which is encouraging. Second, public- and private-sector decision-makers now have a multitude of instruments available for better assessing the social and environmental ramifications of their actions. And, third, in business one must not let the perfect become the enemy of the good. We have not solved all of the problems associated with GDP, but we have come a long way in reducing many of its distortions. Instead of seeking a new, disruptive framework to replace current data and analytical techniques, we should focus on making thoughtful, incremental changes to the existing system. Urs Rohner is Chairman of the Board of Credit Suisse.